Knife, gun, flashlight…the basics of everyday carry (EDC). 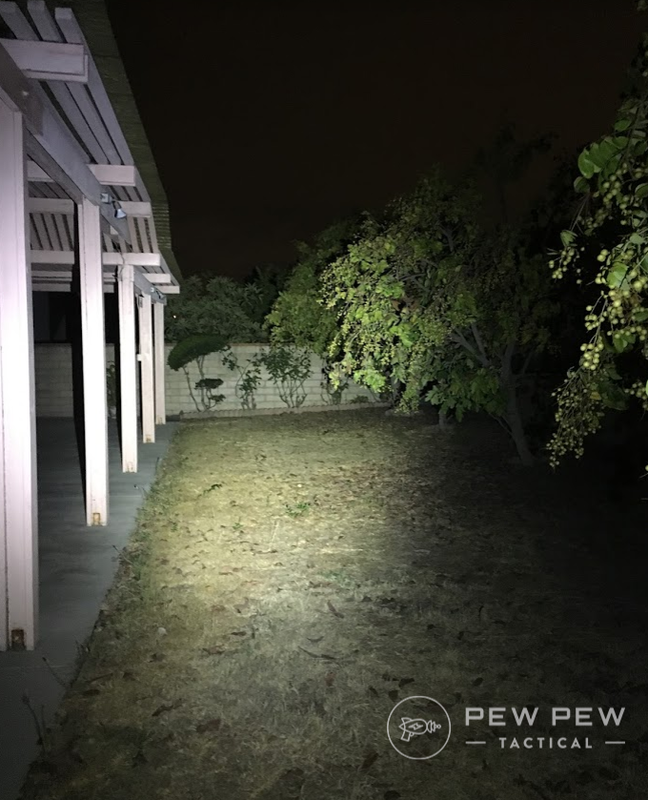 We purchased the top EDC flashlights out there and used them everyday. This isn’t just some roundup of Amazon reviews where the writer doesn’t even have the lights…we subjected these to some good ole torture testing like dropping them onto concrete multiple times and submersion tests. Plus pictures of the beam spread and lighting up dark spaces so you can see how each light performs. 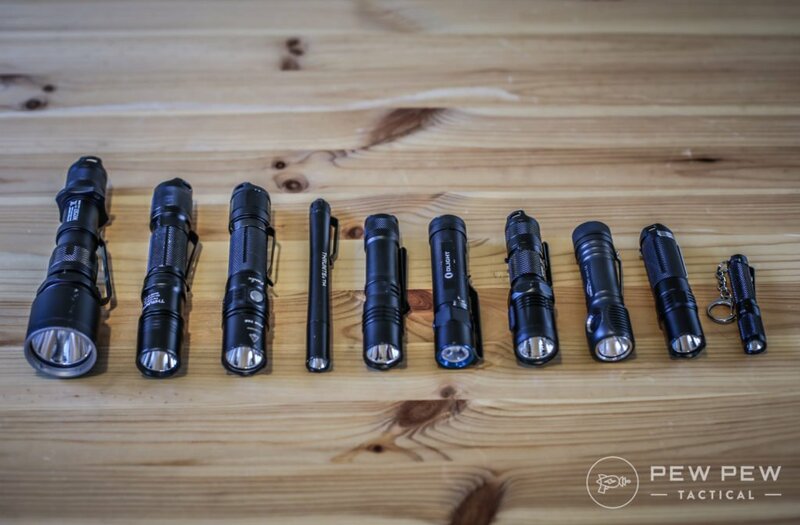 We’ll first start with what we consider an EDC flashlight and move into individual lights. 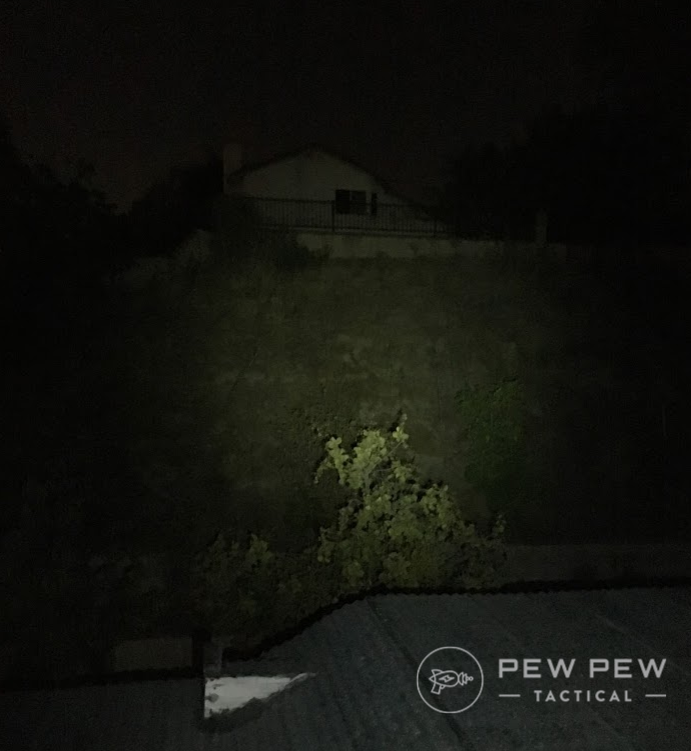 We have an article on Best Tactical Flashlights which are super bright and have an end-cap on/off button for use with a gun. For EDC we focused on ultra-portability and low weight so you can carry it anywhere you go…literally. Size: easily carried around, while not sacrificing on operating performance. 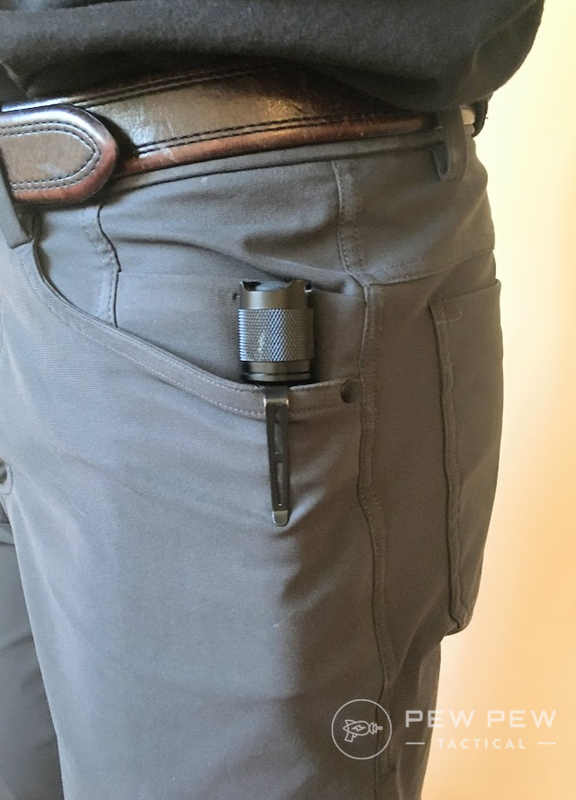 100 Lumen: a sufficient amount of downrange reach, yet still small enough to stay in the pocket all day comfortably. Lumen measures the amount of light being output by a source within a given area and time. The higher the lumen, the brighter the light is. The definition of one lumen equals to the amount of light received at a square foot area one foot away from a candle light. But that doesn’t really help…so here’s some comparisons. A 100W incandescent light bulb generates about 1600 lumen. And a typical headlamp of a car outputs about 700 to 1200 lumen. CR123: 3V lithium high output battery commonly used in high performance electronics. A quality CR123 battery can carry up to 10 years of shelf life, and usually cost around $1 to $2 per battery. 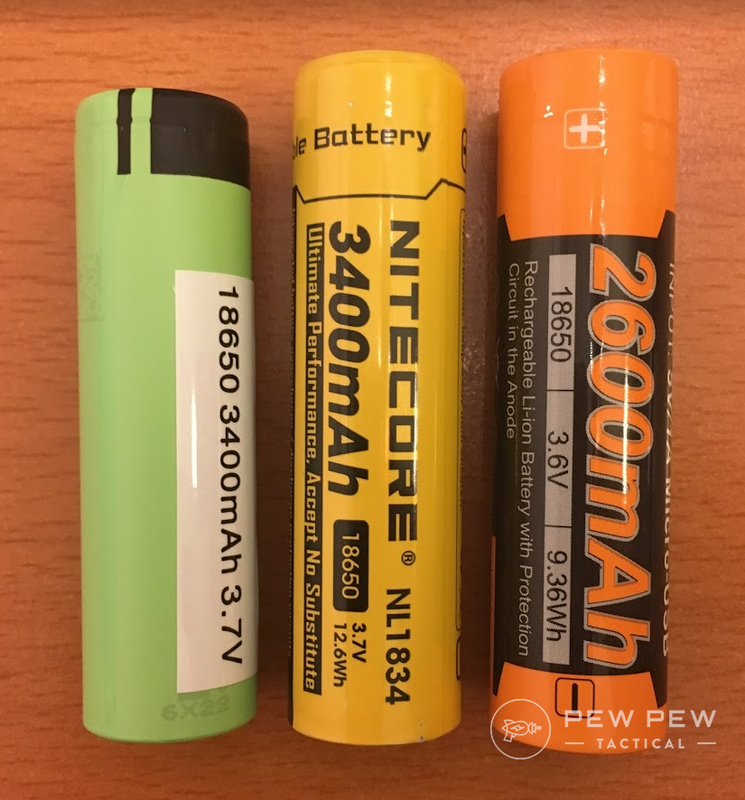 18650 (18mm by 65mm): 3.7 V rechargeable lithium-ion batteries. These are also the batteries used in the Tesla Model S sedans. They typically cost $3 to $6 per battery. 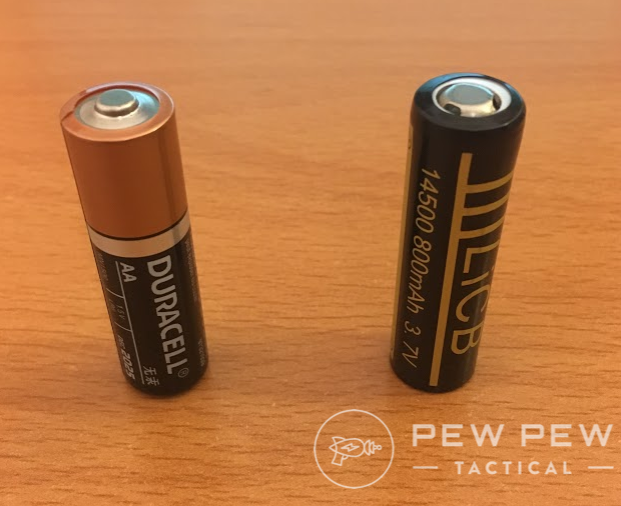 Many flashlights would take either a single 18650 battery, or 2 CR123 batteries. 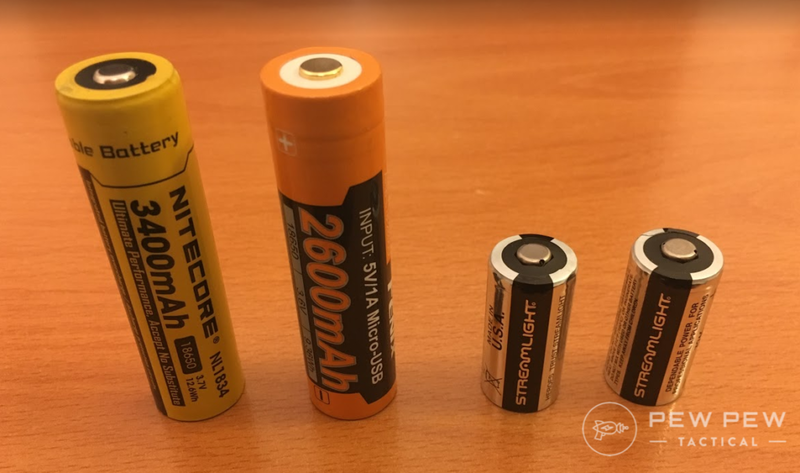 14500 (14mm by 50 mm): 3.7 V rechargeable lithium-ion batteries that are the same size as traditional AA batteries. They typically cost $2 to $6 per battery. 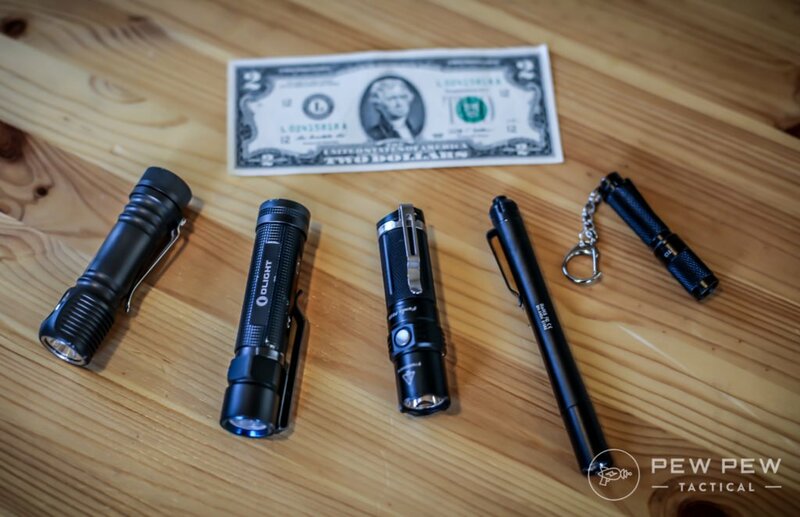 We decided to score the flashlights based on three categories: lumen output, ease of use, and ease of carry. 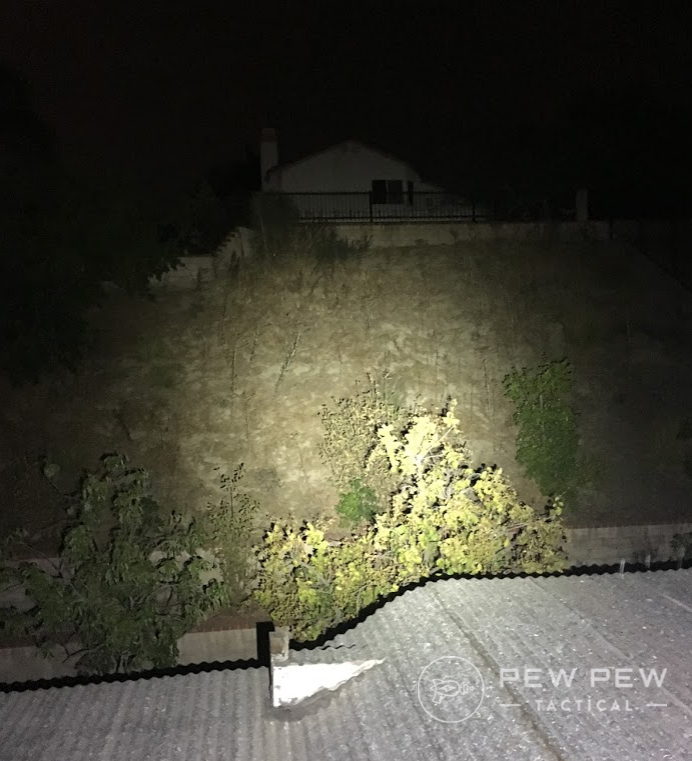 For ease of use, we look at how easy it is to turn on and off the light, to switch between various modes, and how easy it is to hold a pistol while using the light, etc. For ease of carry, we looked into various carrying method including holster carrying, pocket clip carry, or simply keeping the light in a pocket, etc. Enough talking, let’s see our first contender on the list! 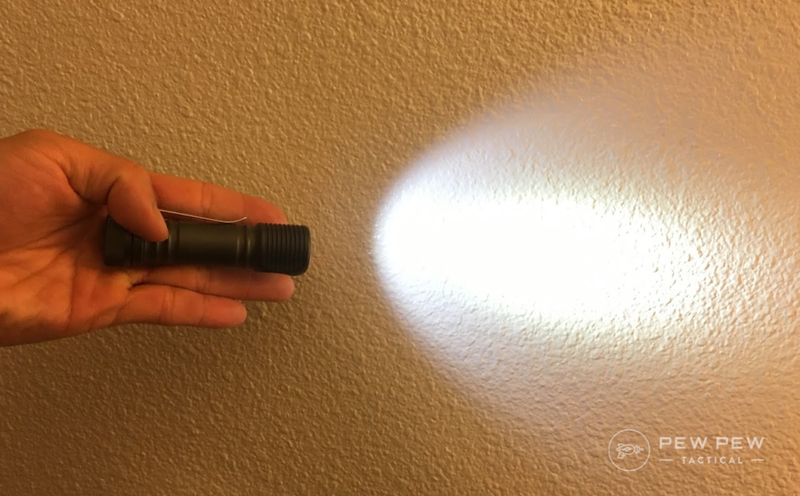 A simple compact tactical light. 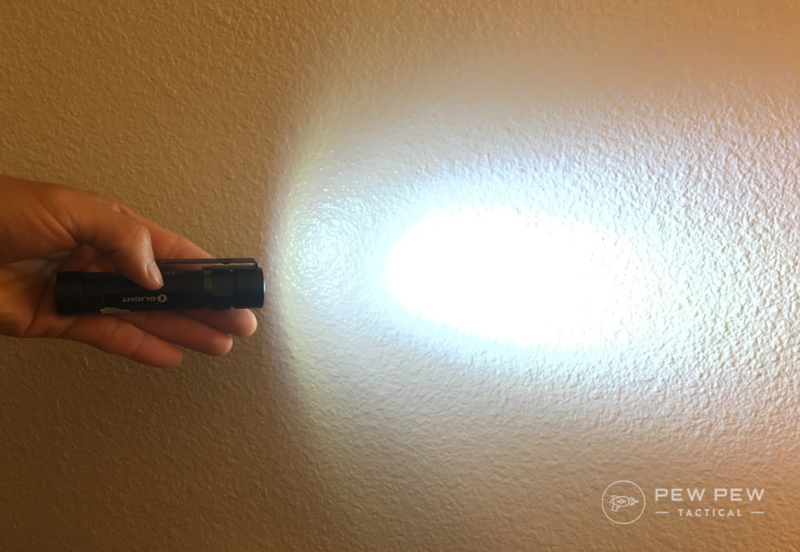 This light is pretty much the smaller version of the Fenix PD35 TAC light, which did well in our Best Tactical Flashlight review. 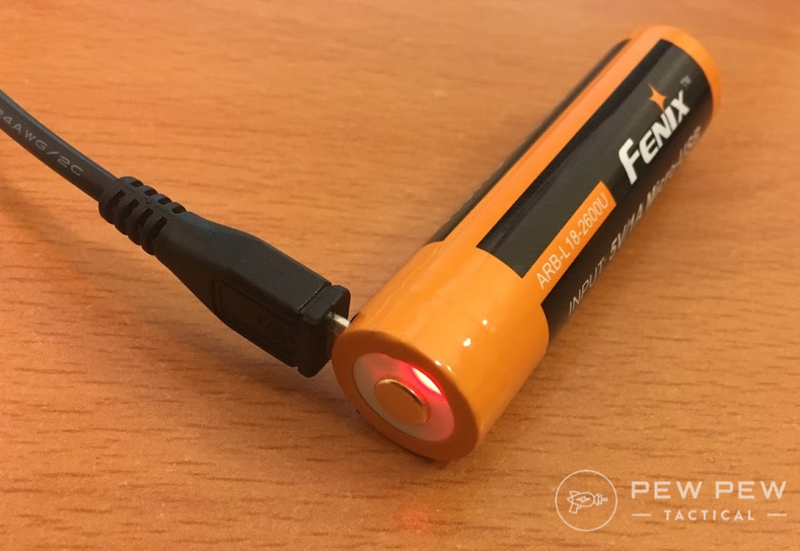 The light comes with a mini-USB rechargeable 16340 battery, which is the same size of a CR123. This means you don’t need an extra charger to charge the battery. The 16340 has a higher voltage, which provides brighter lighting output (550 lumens vs. 400 lumens with a CR123) but a slightly lower capacity, which does not allow the light to run as long (2 hr 25 min vs. 3 hr 15 min for a CR123). The light cycles with a second button between Turbo 550 lumens, High 150 lumens, Mid 50 lumens, and Low 5 lumens. 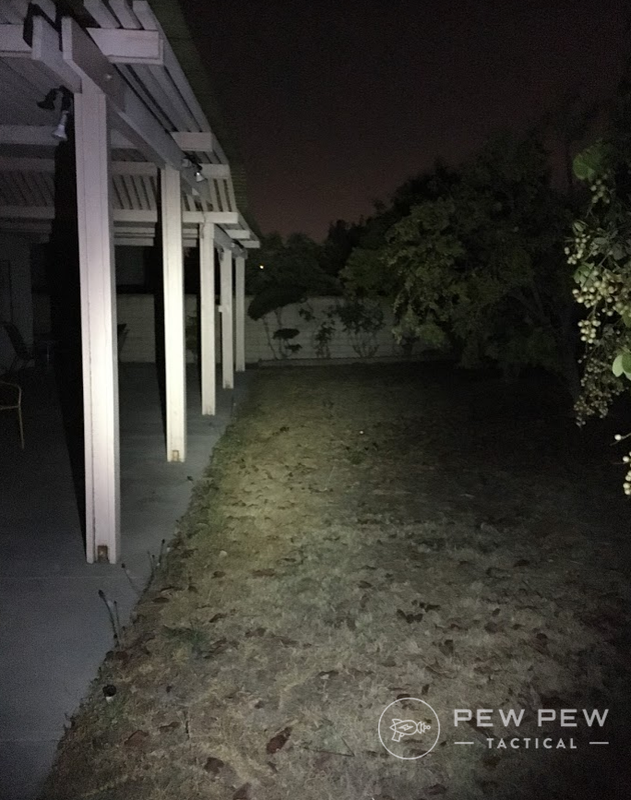 In order to get to the 550 lumens at Turbo mode, you will need to use the rechargeable 16340 that’s included. While testing everything, I got spoiled by 1 button operation, but the great thing with the tail-end power switch is that you can use the Harries technique for handgun shooting. 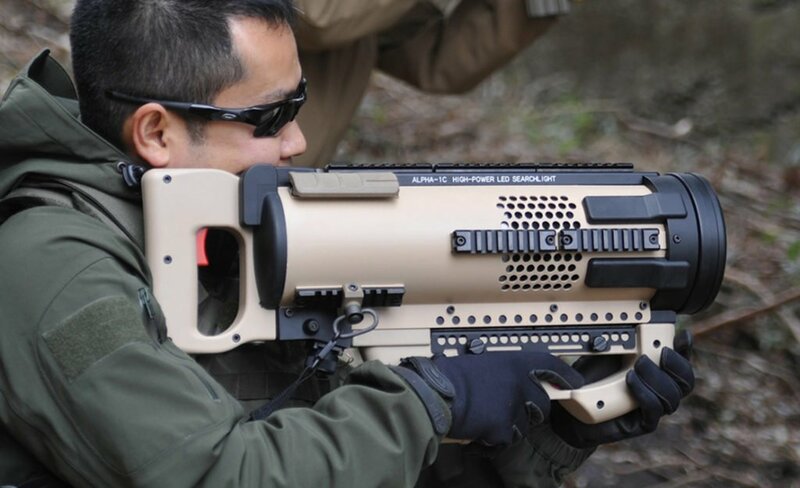 So this light crosses the realm of both tactical & EDC. The light manages the temperature pretty well overtime. After leaving it on for 30 min in the Turbo mode, the light only gets warm. 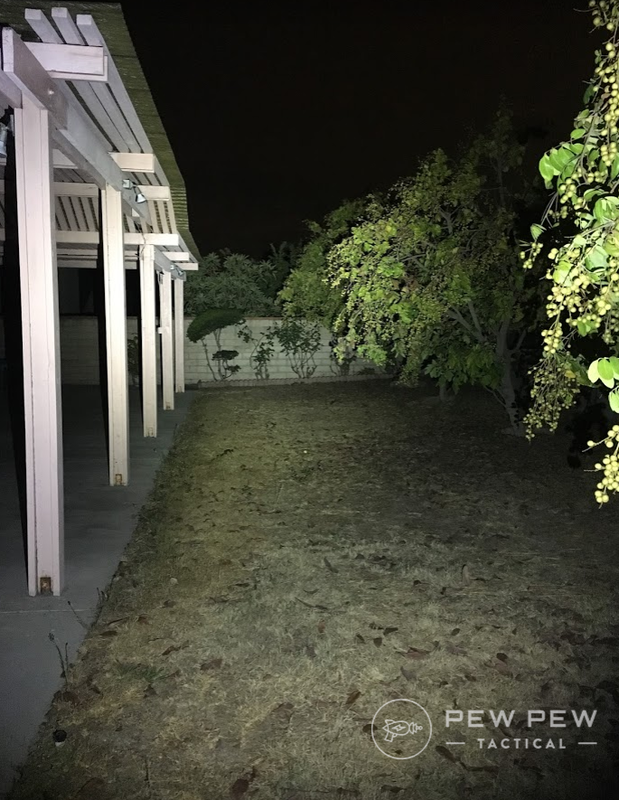 At around 15 min, you can notice the brightness of the light significantly decreased. Since brightness decreases, the light bulb does not generate as much heat any more. As is a general lighting area on the hill. There you have it…the PD25 is our favorite pick for EDC light because of it’s small size, USB charging capability, multiple modes, and crossover into tactical light territory. 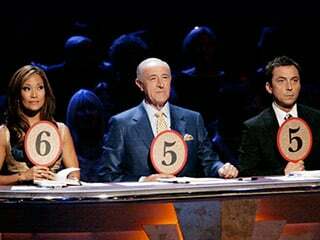 What’s your take on the PD25? The Zebralight is considered the Apple brand in the flashlight world. They are well designed, easy to use, with superior craftsmanship. At 3.64”, this light fits very nicely in an average adult male’s palm and the grooves cut into the aluminum body of the light gives a sense of high grade machine work. The light switch is intuitive to use and easy to locate. The package come with two additional O-rings. And the light comes with a pocket clip already installed onto the light. Note that this light takes a non-standard “unprotected” 18650 battery. The standard 18650, which has an internal protective circuit would not physically fit in this light. The unprotected 18650 battery this light requires does not come with the package, and costs about $7 to $14 each. The unprotected 18650 can be charged in a standard battery charger however. The Zebra SC63 light has three default modes: High, Medium, and Low. And it also has 3 additional modes to allow users to program the light. The light does get very hot after a short period though. 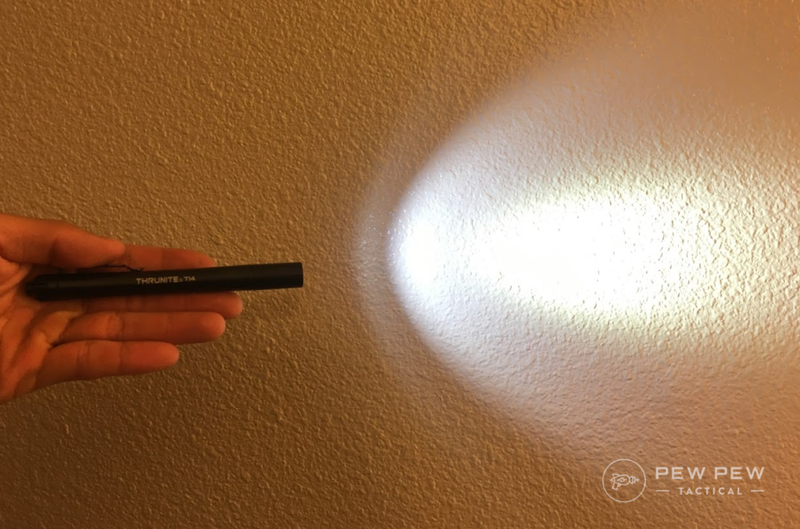 After just 3 minutes of use on High, the front of the light becomes uncomfortable to touch. 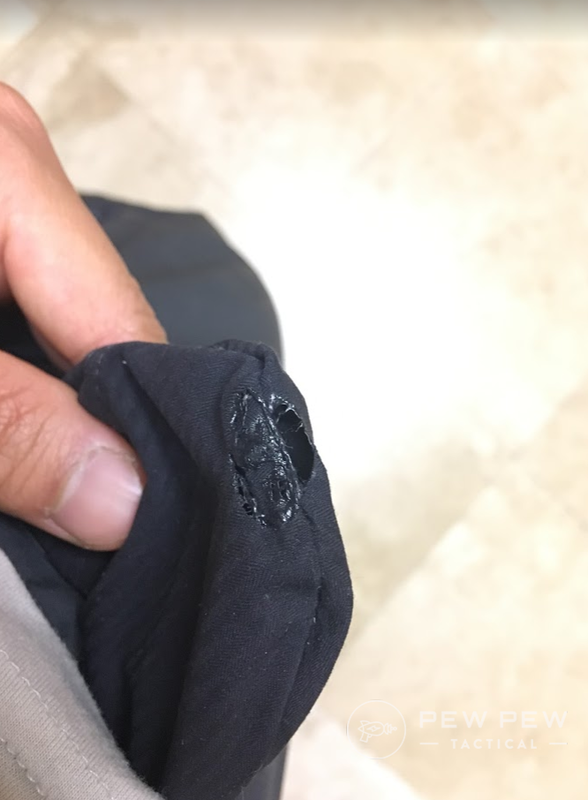 Over the last 30 days, there have been two instances when I accidentally left the light on for several minutes while carrying in the pocket, and it burned a hole in my pants! I kept the flashlight in the same pocket as my cellphone, and I suspect the corner of the phone may have accidentally turned the light on while I was moving around. The large power button was designed to be easily located and turned on, but in this case that may have allowed the light to accidentally get turned it on. I probably had this light in the pocket for 30 days, and it got turned on twice. Might not be a very high chance, but it will happen for EDC carrying eventually. To ensure the temperature would not be an issue for the light, we went ahead and tested the light on the High mode for a full hour. Although the front on the light remains hot, the light worked just fine. 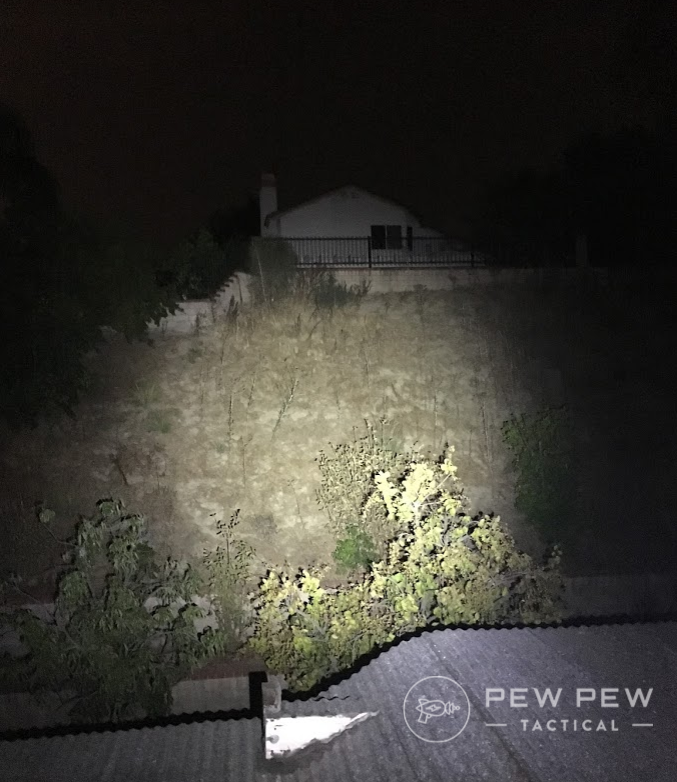 And its strong, focused and powerful 1300 lumen beam on a hill. And a wider spread in the yard. All in all…if you need the brightest light in the smallest package…the SC63 is the way to go. Be sure to know that you’ll have to use a more exotic battery and you might have to watch if it accidentally turns on in your pocket. This is a premium well-rounded light! Robust, fine machine craftsmanship, and well thought out user design. 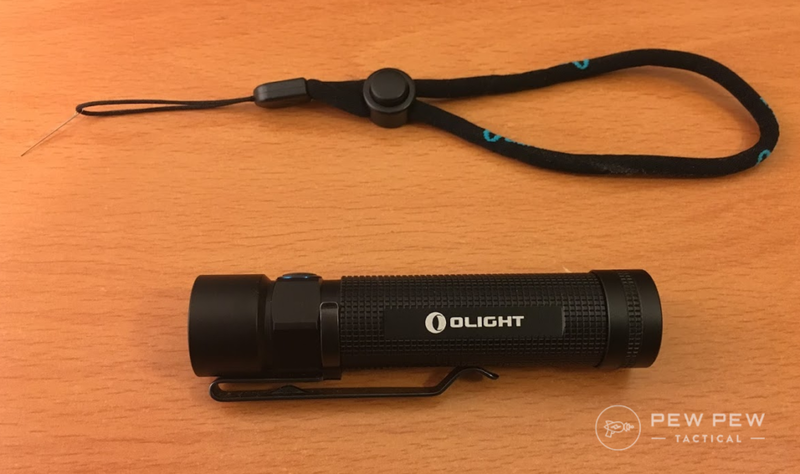 This makes the light very easy to use and carry. 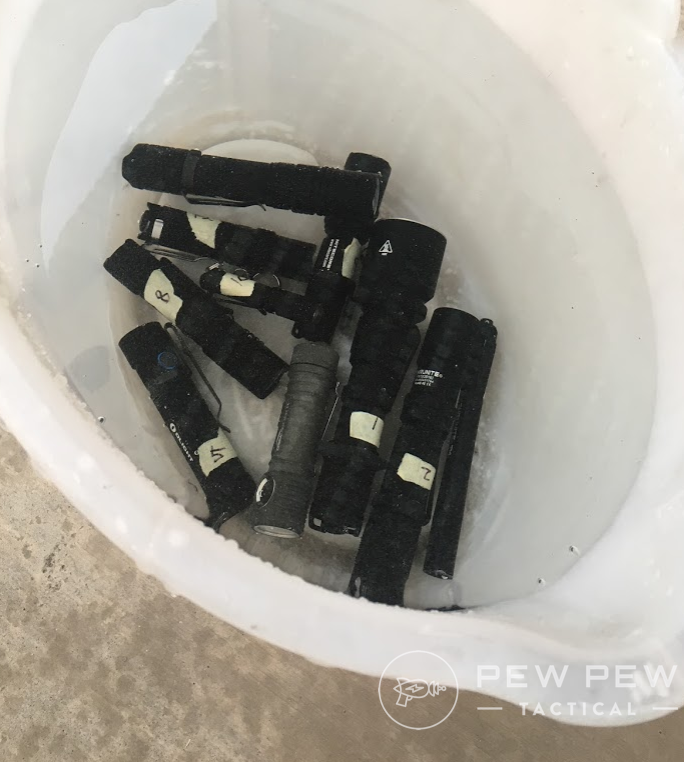 The elimination of the tactical tail cap switch may be a downside for some at first, but this actually saves a lot of room on the flashlight. When I first started carrying this light, I found it quite annoying to locate the power button without looking at the light, since it does not protrude out of the light much. But I soon found a solution…I positioned the pocket clip directly on the opposite end of the power switch. And since the large pocket clip is very easy to locate…it guided my fingers to the button. Single press on the power switch takes you to the last memorized setting, and there are several settings to choose from: Turbo 950 lumens, High 400 lumens, Medium 80 lumens, Low 10 lumens, and Moonlight 0.5 lumen. The light takes a standard 18650 battery, or 2 CR123 batteries. 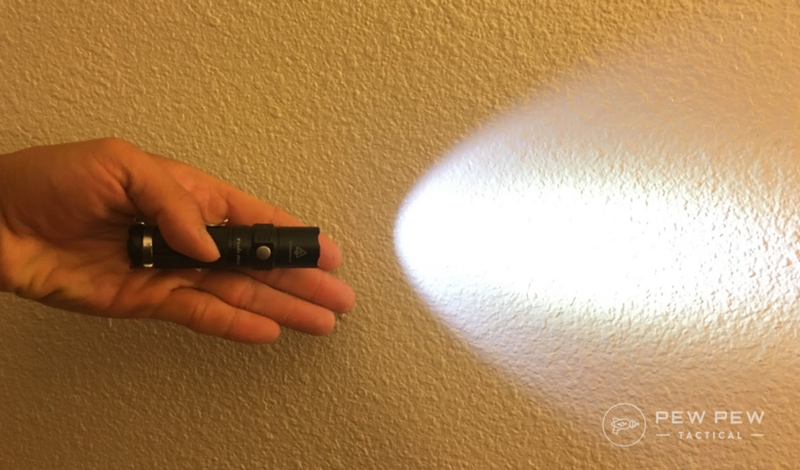 From the off position, 1 second press takes you to the 0.5 lumen moonlight mode, double click takes you to the Turbo mode at 950 lumen, and triple press takes you to the Strobe! You can also cycle the light once it’s turned on. And a well lit and more general spread on the hill. 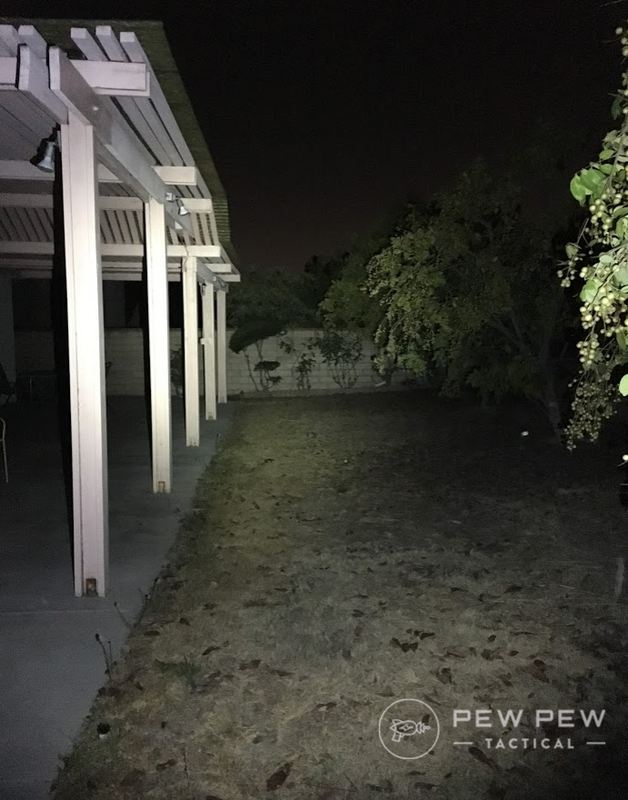 And a great backyard light due to its 950 lumens. It does takes some thinking at first to operate this light efficiently. But I found that once I remember the setting, it was very intuitive to use. I like that you can go directly to a common setting without having to cycle through the modes. The moonlight mode was especially nice during the dark when you go use the restroom at night. A great light designed to light up a whole area so you can see everything in one glance. A light is only as useful as you would carry it. The advantage of this penlight is how slim it is. It fits in the pocket nicely without you knowing it. You can put it in pockets of a blazer, dress pants, or even dress shirts to remain classy and low profile. The ergonomics of this penlight may even allow you to use it as a small defensive weapon designed for pressure point strikes. I carried a penlight like this everyday back in the college days. The light is slick, with no texturing. Some may think this may be too smooth to hold. It takes 5 clicks to get to the Turbo mode: starting with Firefly 0.3 lumens, to Medium 24 lumens, then finally to the Turbo mode of 252 lumens. I’d imagine from a tactical perspective, you would want to have the Turbo mode out first. Maybe the light designer has designed this light as a primary Firefly light instead? I would still carry this light as an EDC! Regardless of the hassle, I can get used to the Turbo mode activation eventually. The light can act as a self defense impact weapon if needed, so I would actually carry this light in the dominant side pocket. And since it’s slim, even if I have to carry a gun on the same dominant side, it still would not hinder my gun draw. The light takes 2 AAA batteries. 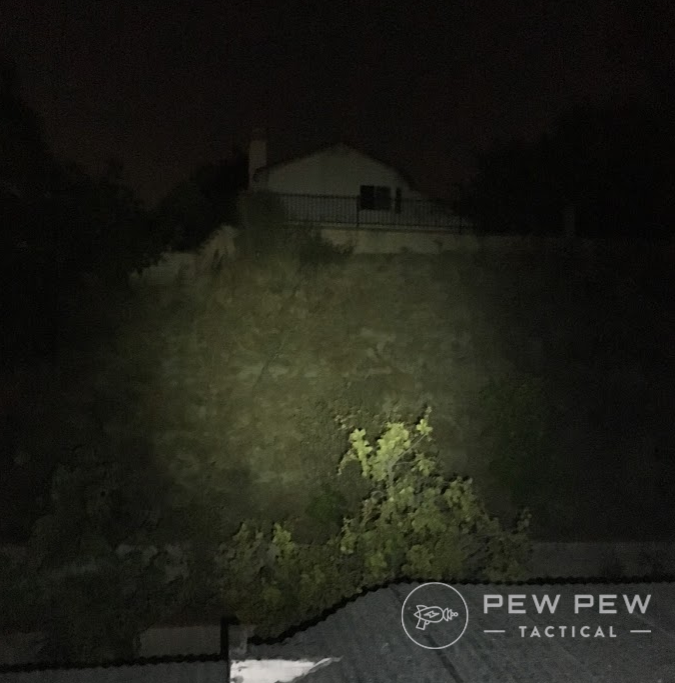 The beam distance is rated at 67 meter (~220 feet), so you can probably still light up a small yard with no problem. Here is its beam spread. And it can still light up a backyard fairly well in such a small package. 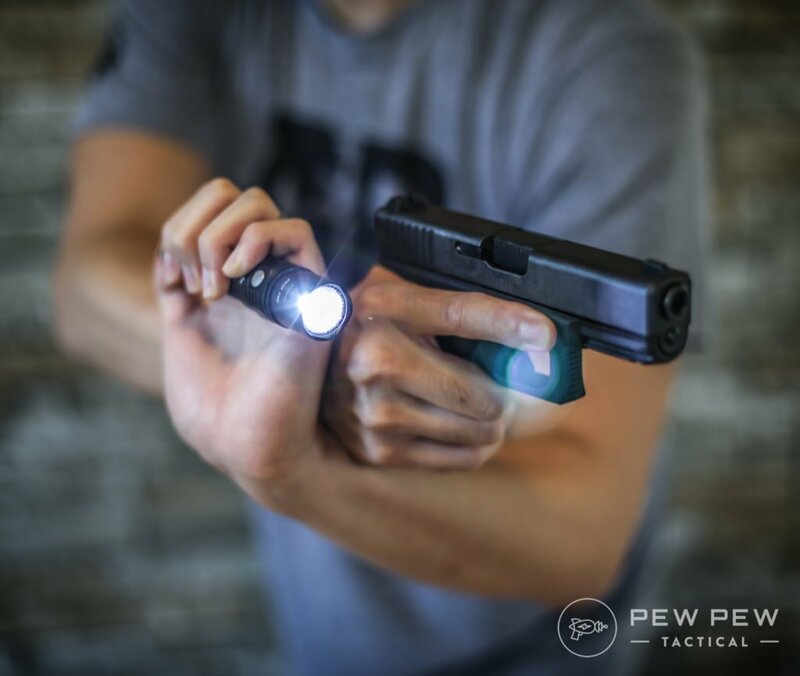 If you’re already comfortable carrying a pen…this EDC light will be as nondescript and can also double as a striking defensive weapon. Plus the lighting is decent for the size. Here’s the perfect back up/ headlamp light! Two is one and one is none…so we can always use a back up light. Because of how small the light is, I almost don’t feel it when the light was added to my keychain with its included hardware. 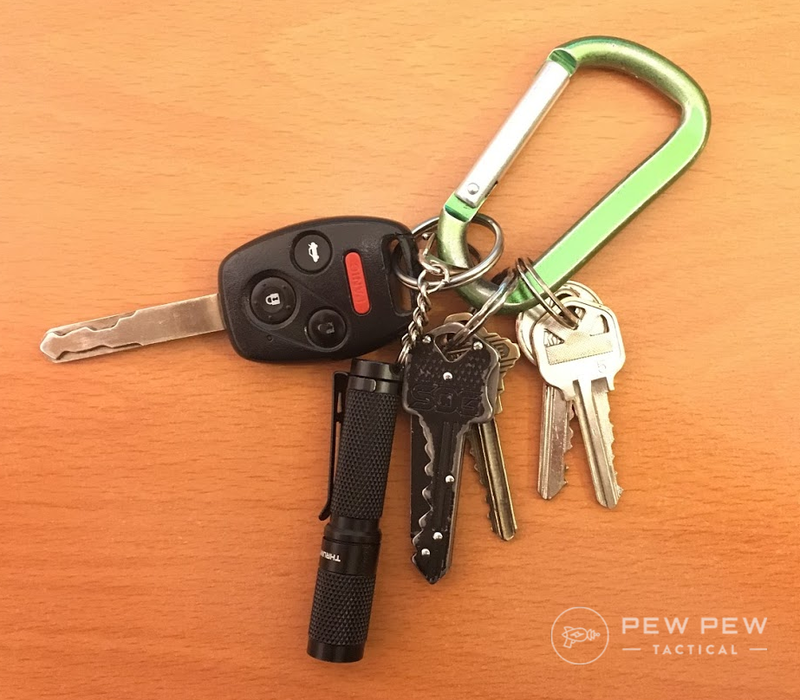 Besides the keychain attachment, the light also came with a pocket clip. In one direction, it fits very deep inside the pocket. In the other direction, you can easily flip the clip and attach it to the end of a baseball cap, making it a headlamp! Because of how lightweight the light is, it works very well as a headlamp. 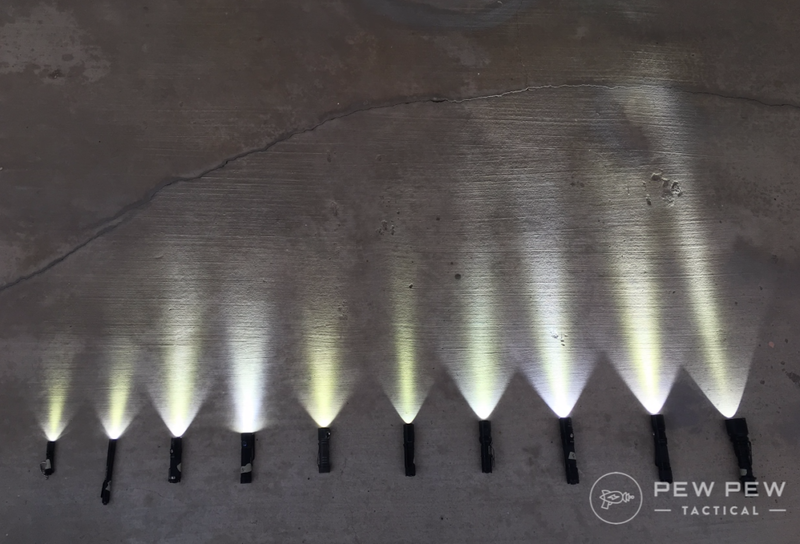 The light provides a nice beam spread, and is capable of lighting up a walkway with no problem. What I found a hassle was that it takes three turns to get to the High mode. It cycles from Firefly 0.04 lumens, to Low 12 lumens, to High 120 lumens. It also has a Strobe mode when you cycle it on and off for 4 times. I would only use this light as a backup because of how dim the light is, and how much trouble it is to get to the High mode. 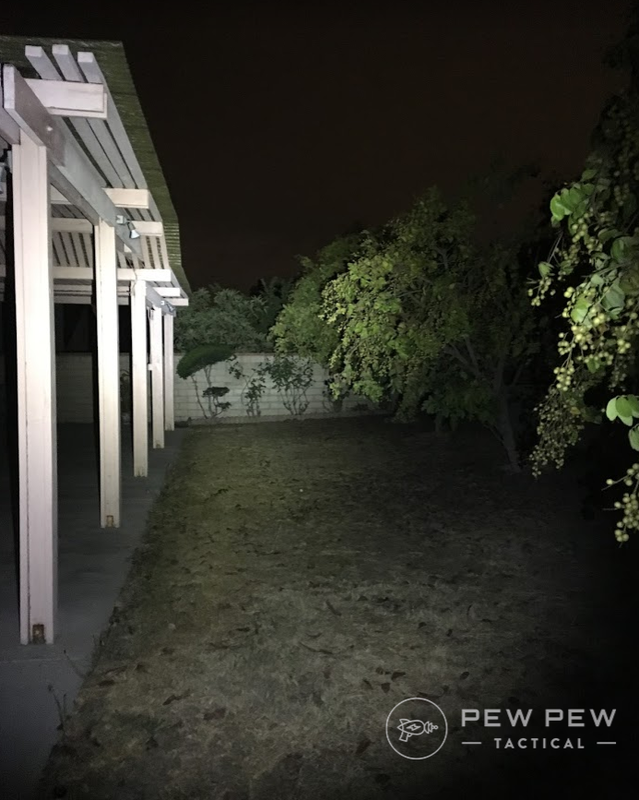 It’s worth to know that comparing it to the built-in LED light from an iPhone 6S, the Low setting of 12 lumens is still brighter. It does choke up when we start lighting up the outdoors. But is still ok for lighting up general areas in its highest mode. Have no space for an EDC light? The Ti3 attached to your keys can help. Though the output is paltry compared to the other lights…it’s still better than a phone. Plus it doubles as a headlamp for hands-free operation. To ensure all the lights live up to its manufacturer ratings, we subjected all of them to basic impact and water resistant tests. After the five drops, we ran a successful function check by cycling through the settings of the the lights to ensure they still work properly. The lights do suffer minor scratches and dings on the surface. After the drop test, we subjected the lights to 30 minutes of water submersion in 1 foot deep room temperature water. But the lights all function just fine. Again all lights have successfully passed the test! 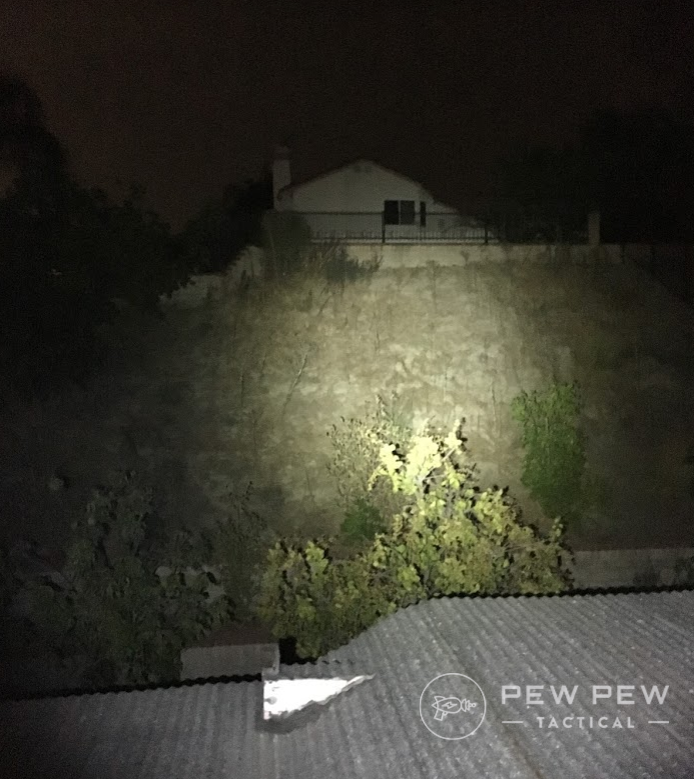 You’ll see more than the 5 lights in this test since we also have a Best Tactical Flashlights. In casual wear, I would holster a flashlight on my support (non-dominant) side. But sometime I need to dress up business casual, with a button up shirt tucked in. In that case, holstering a light is a no-go. And carrying a regular tactical flashlight on a pocket clip may seem strange and “too intimidating” for the “friendly workplace” policy. 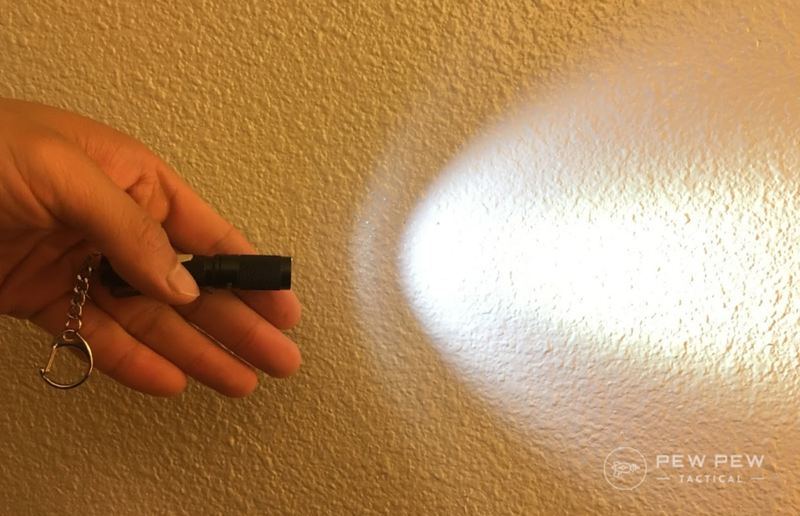 I also found it challenging to reach my cell phone when I use the pocket clip to carry the light; the tail of the flashlight often scratches the back of my hand when I reach for the cell phone. I would opt for a compact light that’s small enough to completely fit into the pocket. That way it won’t interfere with my hand when reaching for the cell phone. In conclusion, product engineering is always a trade off. And depending on what you’re looking for, here we have different solution for you! 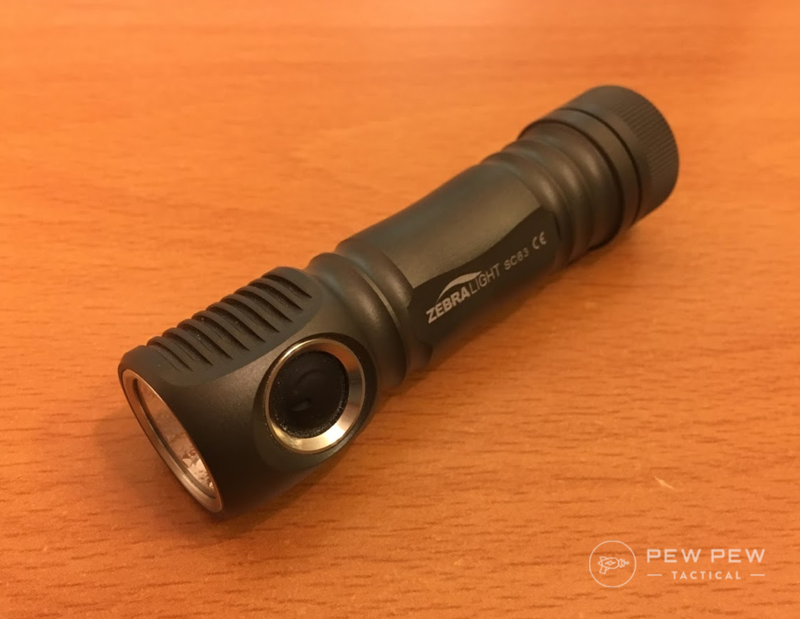 If there’s a preference for tactical tail cap switch and overall EDC go-to light, the Fenix PD25 would be it. Zebralight SC63 is indeed a very well engineered light, but be aware of the excess heat generated during operation. 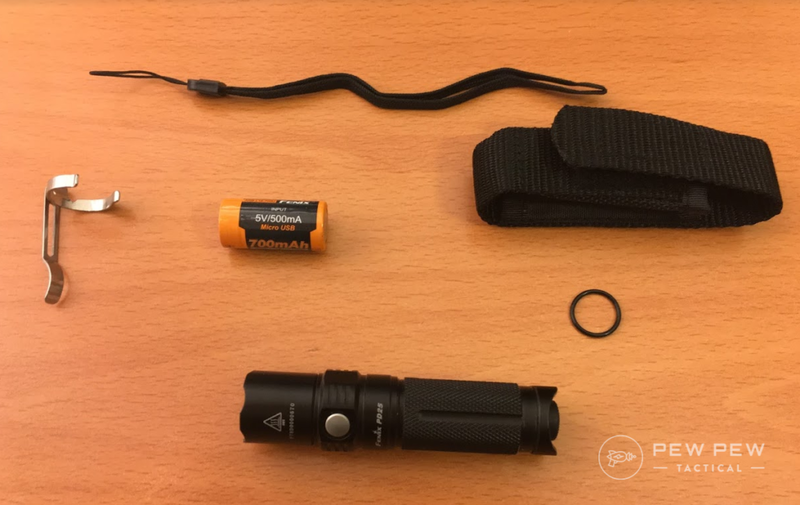 Olight S2 would be my best-designed single-button and bright EDC light. ThruNite Ti4 CW would be an ideal light when dressing up for formal events, or when you want to have a back up Kubaton with you. 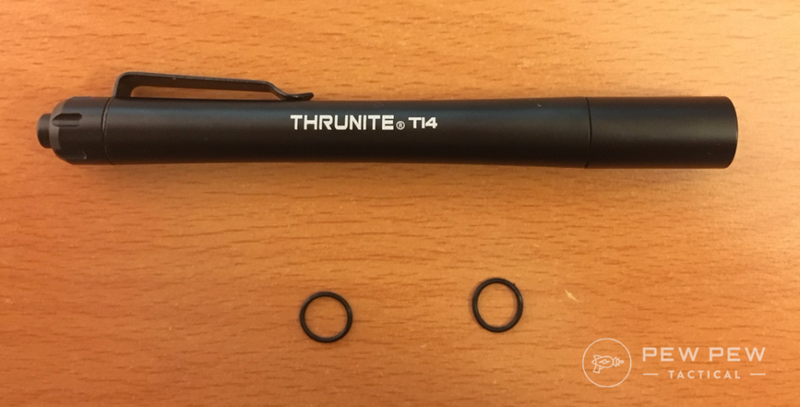 And last but not least, the ThruNite Ti3 would be a backup light on the keychain when you desire one! How did we do? 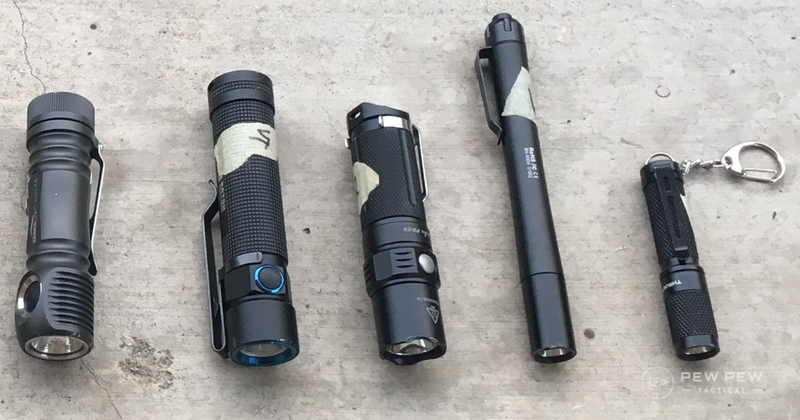 Any EDC flashlights we missed? 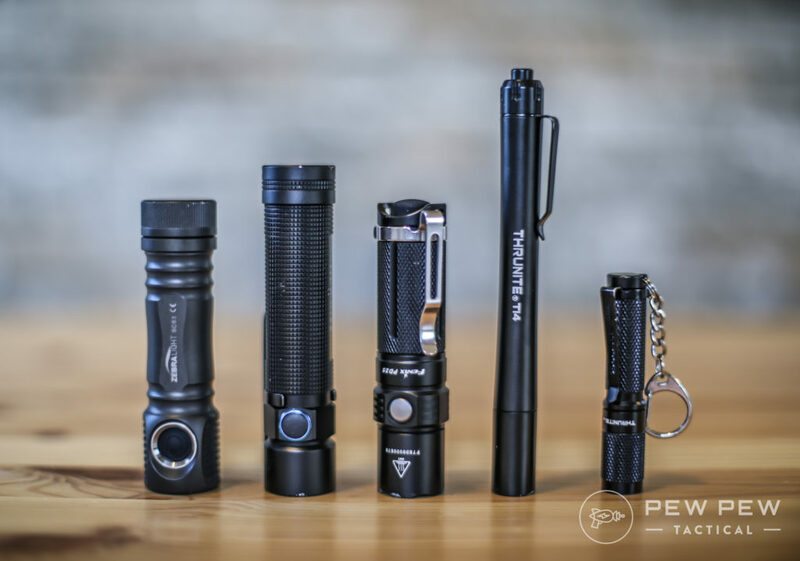 Of if you need something more robust…check out our Best Tactical Flashlights. 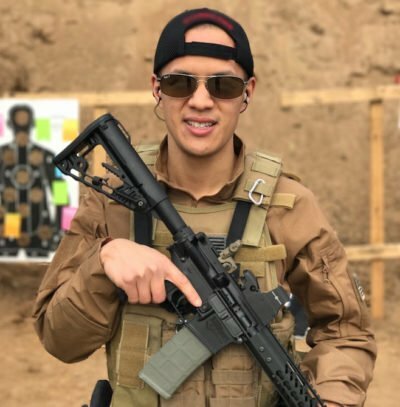 AC works in the body armor industry as an engineer, and his job is to stop the bullets and save lives. He’s also a certified NRA Pistol Instructor and successfully completed the Police Academy. In his spare time, he enjoys CrossFit, competition shooting, and pursuing his MBA degree. I’ll never buy another OLIGHT product because they don’t respond to warranty inquiries. Apparently their “3-year warranty” is just words on paper. After emailing them and calling to leave polite messages, I received ZERO response from them, leaving me with a useless $60 flashlight. I’d suggest trying one of the other brands listed here, only because of OLIGHT’s lack of customer service. Great list, thanks a lot for the reviews. Could you tell me in the last picture, where you have them lined up, what’s the 4th one from left to right ?? It seems to be the one that has the most focused output. Photon Pro is a great EDC light. Thanks Wolf, I remember these little guys from way long ago. Glad we could help out, Roger! Tip for lights that turn on in your pocket. Unscrew the tailcap about 1/8 – 1/4 turn when you put it in your pocket. It sounds like a pain but it only takes a day or two to get used to it. I do it one handed I’m so used to it now.